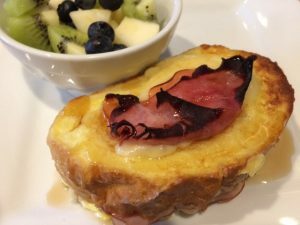 Rustic French Bread stuffed with thinly sliced Black Forest Ham and a slice of Gruyere Cheese, dipped in an egg batter and baked until golden brown. Warm Maple Syrup drizzled over the top and and served with fresh pear, kiwi and blueberries. Oh Yummy!